If you take a look at my Furniture Inspiration Board on Pinterest, you'll see multiple projects involving metal. I'm pretty comfortable with just about any power tool when it comes to wood, but metal is just an area I haven't really delved into. 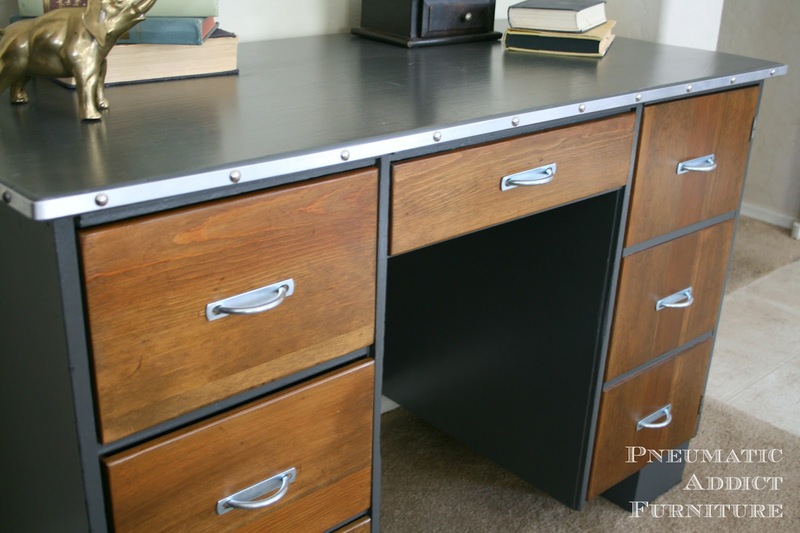 The only time I've worked with metal was to cut off bolts with a grinder or apply the aluminum trim around my Don Draper Desk. "Stop being a sissy. People work with metal everyday around the world. You should be able to also!" Both the Industrial and Contemporary European styles that are hot right now utilize metal, so I decided it was time for me to learn to weld. Both the husband and I have been saying he needs to teach me for years now. We finally got around to practicing a bit. I'm no where close to an expert on this subject. My husband is VERY knowledgeable about metal working. When not at school or work, he can almost always be found in "his half" of the garage, welding, grinding, or fabricating something for his Jeep (A.K.A. 'The Other Woman'). A couple years ago, when home building was slow, he had a good friend at a steel shop give him a job. Not only did it save our bacon to have the income, but Bryce also got a great hands-on education in metal working. 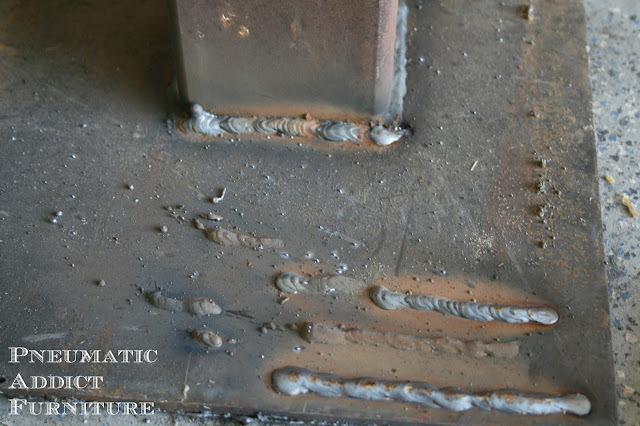 Welding is a MASSIVE field, and it would be entirely impossible to give you all the information about it in one post. I'll just touch on the basics and give you some info about welding from my VERY novice point of view and I'll refer to the experts. First of all, watch this video. 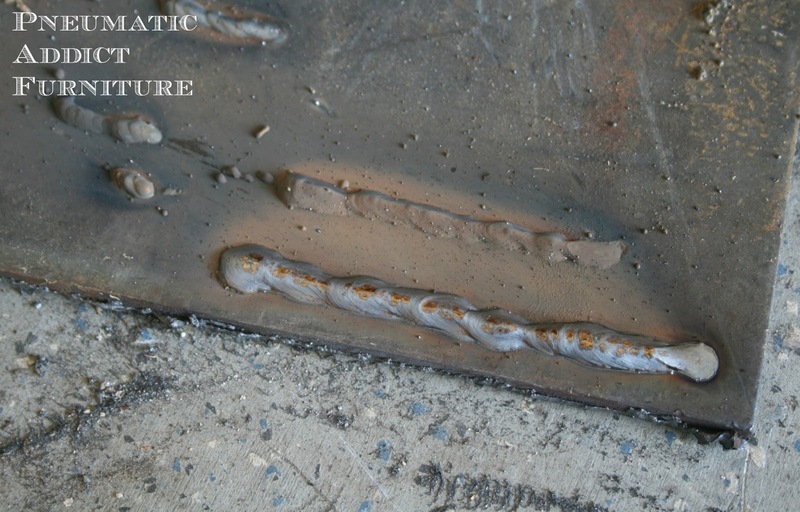 It talks about the 3 main types of welding (Stick/Arc, MIG, and TIG). Before you start using any sort of metal working tools, make sure you are wearing the proper safety clothing. This is no joke! Not only are you dealing with extreme heat, sharp metal and power tools, but the light from the welder is dangerous. It can cause blindness and serious burns. PLEASE! 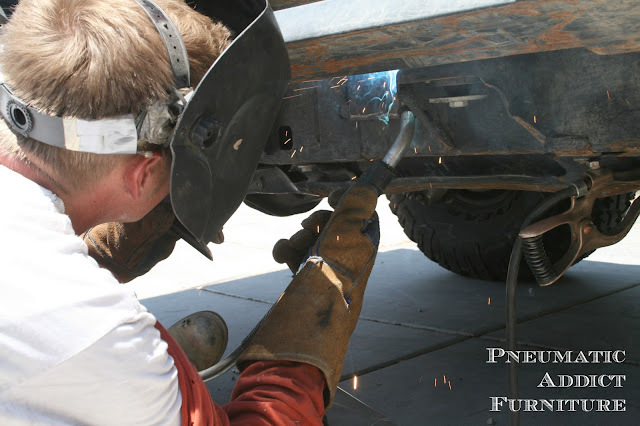 Make sure to wear protective clothing, welding gloves, and a welding helmet! 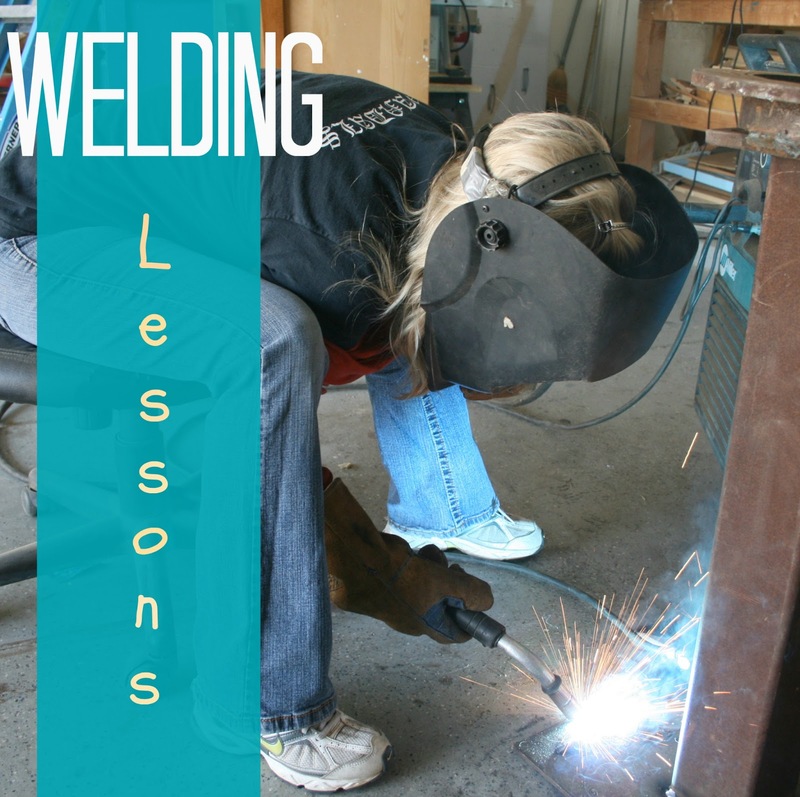 Then, find out everything you can about your type of welder. We are lucky enough to be borrowing a very expensive, professional welder from a friend. The machine we are using is a Flux-core MIG welder. For occasional or decorative use, you can buy an inexpensive, basic Arc welder for around $70 or a MIG welder for around $100 from Harbor Freight with a coupon. Keep in mind, just like with other tools, better quality typically means a larger investment. Also, you will need a 220v outlet to plug it into. Fortunately, most homes have at least one that the dryer is plugged into. Before Bryce wired an extra 220v outlet in our garage, he would just run an extension cord from the laundry room to the garage. Make sure to read the info on your welder to find out the correct amps and outlet. Once you've done tons of research, got your welder set up, and get suited out in your safety gear, time to start practicing. There is so much to consider! (temperature, depth, speed, etc.) so I would really recommend reading the instructions with your welder, as well as watching some videos. This video is helpful. I HIGHLY recommend watching the whole series he has posted. 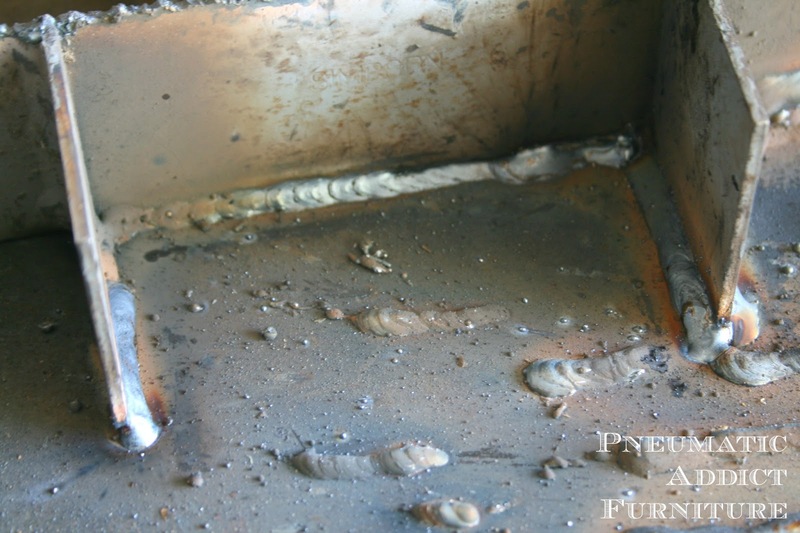 With a little more practice, I was able to get the "stack of dimes" to my weld that you want. I still have to work on my consistency with my bead width. Bryce says "Pretty good for a beginner". I'm happy with my first results, but I'll keep practicing. I've got quite a bit of welding planned ahead! Holy Cow!! 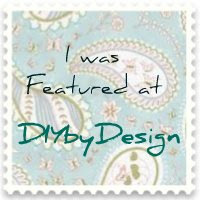 I am super impressed! I am in love with the look of metal and wood and have been dreaming of learning to weld....I said dreaming....You are my hero! So so awesome! I am pinning this so that when I decide to actually learn I can re-watch all your video links! Thanks! Go Elisha!! You rock! I would love to learn this skill too!! We should so be neighbors. Wow...that would scare me to death, I would burn something down!. GOOD for YOU...amazing!!!! I'd love to learn how to weld! I didn't know you could buy a welder that inexpensive. Thanks for the info. Can't wait to see what else you do! Wonderful! I bought an inexpensive MIG welder from HF to make spot welds on my chicken coops. It's another fun 'toy' to 'play' with - it cost less to buy the machine than to have a welder come to my house to make the repairs, so it was a win-win for me. Fortunately, the chickens don't care how pretty my welds are, as long as they hold the wire panels on to keep out the predators :-) I look forward to some cool metal projects soon! I love that you are brave enough to try this. I've worked with MAPP gas before but real welding makes me nervous. There are so many things that I would like to do if I could just learn this skill. I'm feeling motivated now. 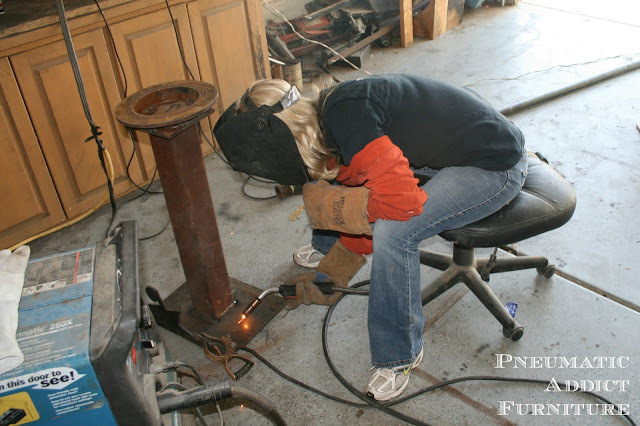 Maybe you could have a class just for women to learn welding! Thank you! I'm taking this weldingproject in the near future. Beautiful work! If you want to grab an opportunity of get the wide range of MIG welders for sale Ireland, then you must not miss visiting the web store of Jebb Tools, which has a huge collection of various types of tools and equipment.